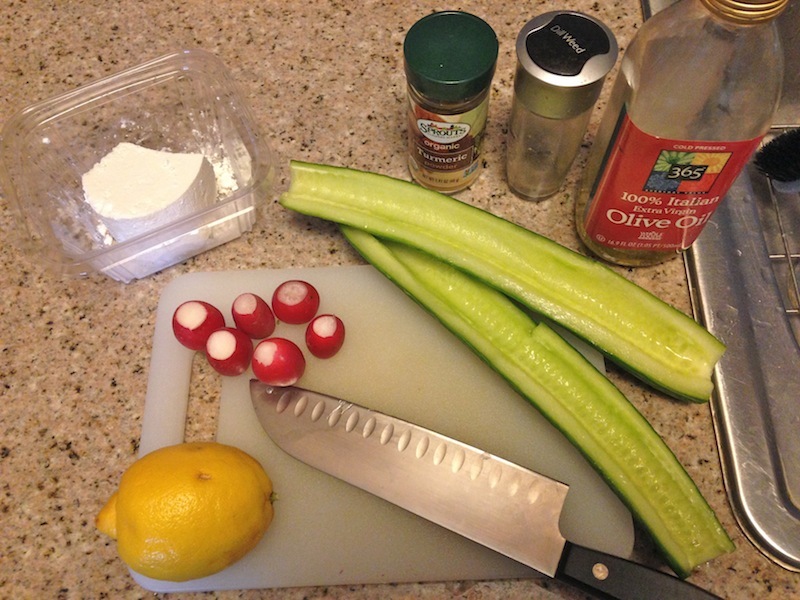 Cucumber Radish Salad | Keep It Up, David! It’s Luna! She’s my pal Tavi’s dog, and I watch her when he’s out of town, including this week. It’s hard to be blue when she’s around, and she requires at least a little activity, in the form of daily walks. I posted a hilarious and adorable video of her howling along with a fire truck on my Instagram account (I’m @keepitupdavid) – so check that out. As a fun experiment, I wore my heart rate monitor during Anne’s aerobics class last night at Slimmons, and that provided a nice mental boost. The class was 80 minutes long. I burned 782 calories. My max heart rate was 152, and my average heart rate, including rest periods, was 114. Nice! And thanks for the kind messages and comments after my last post – you guys are the best! 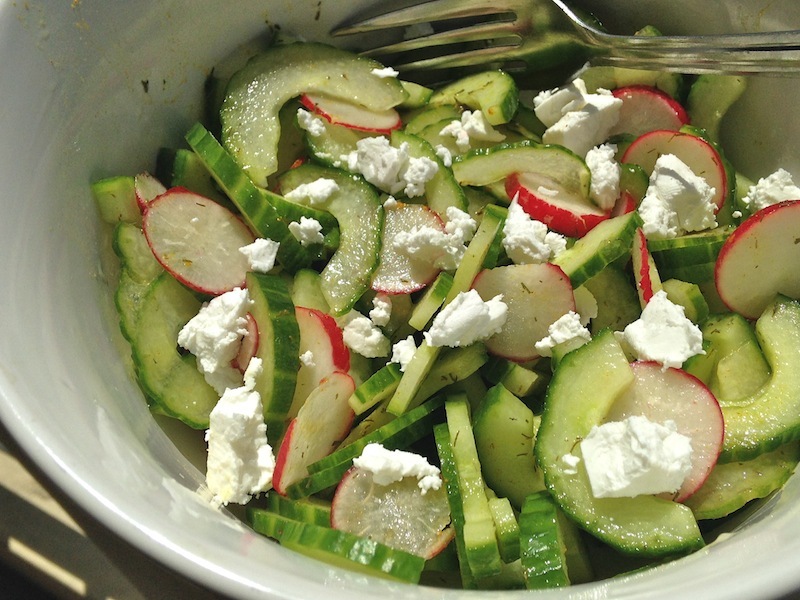 Also wanted to share a simple salad recipe that I’ve made twice this week – my Cucumber Radish Salad. It’s light and bright, with big flavors – perfect for spring. One English cucumber, halved the long way. Take a spoon and scrape out the watery seeds part in the middle. You’ll be left with cucumber troughs. Radishes. Radishes are potent little buggers, and a little goes a long way, so use as many as you like. This is an accent flavor, but it’s a powerful one, so don’t overdo it. I ended up using three smaller-sized ones. Stir it up and toss it with the veggies. Right before you eat it, crumble a couple tablespoons of feta cheese on top. I used a Bulgarian sheep’s milk feta. RELATED CONTENT: Check out many, many more recipes here! The cheese helps cut the bitter and acidic notes that the lemon and radish provide, and the cucumber is a crisp, refreshing base. Best of all, this came together in about 3 minutes – can’t complain about that! This entry was posted on Friday, April 10th, 2015 at 1:36 pm and is filed under Uncategorized. You can follow any responses to this entry through the RSS 2.0 feed. You can leave a response, or trackback from your own site. Glad to hear your spirit is lifted David! How could it not be with that beautiful fur baby to keep you company! I will definitely make that salad. It looks very refreshing! Blessings! Great recipe! I could definitely make this a staple and bring it to work! 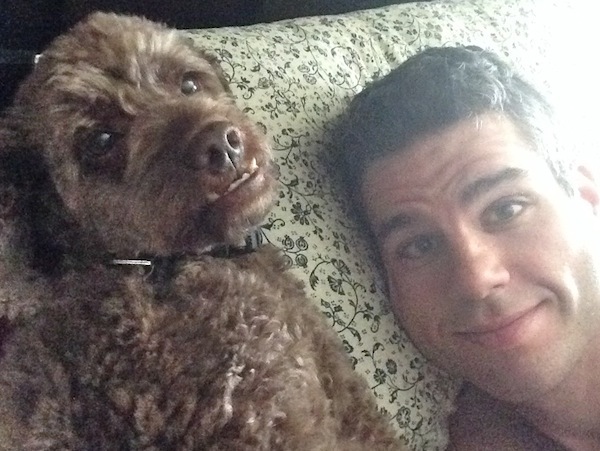 And there’s something almost magical about the way a dog can lift spirits. Maybe it’s because they can read our emotions and we just brighten for hem. Glad you’re doing better. Thank you and I hope you enjoy the salad! We started getting a CSA and have been inundated with radishes so this is a good idea. What the heck else am I gonna do with ’em? This is a great way to use up three of them. Or six if you double the recipe! HA!